Is it Fiction or "Faction?" ... or the other way around? Where do authors get the inspiration to write great novels? From history, headlines, personal experience? Of course it is often all of these, and I'd like to highlight some of my favorite novels and show how those authors were able to create characters, dialogue and descriptions that mirrored certain events and turned them into terrific reads. When I read the previous post by my Rogue colleague, K.J. 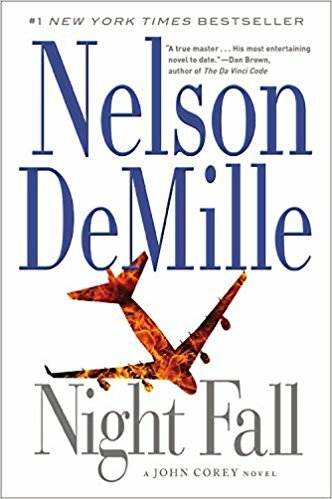 Howe, about security on airlines, it reminded me of the thriller, Nightfall by the popular author, Nelson DeMille. 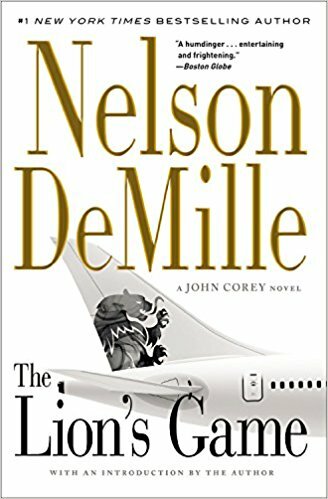 The story obviously was based on the crash of TWA Flight 800 that went down off New York and was investigated by all sorts of agencies. But the mystery of the crash was never really solved. Enter the author who created characters who happened to be making love on a beach and saw the plane go down. They try to determine whether a missile shot it down -- something the government types refused to consider. What a great story. DeMille used another incident several years ago to create not just one but a trilogy based on the US bombing of Libya. In his thriller, The Lion's Game, he does a "what if." What if there's a young militant type in Libya who is so furious about the bombing of his country that he manages to come to the US, and attempt to identify, target and kill the members of the bombing squad. I remember first meeting DeMille at the big publishers' annual trade show, Book Expo, at the Jacob Javitz Center, many years ago. I told him that when I served on the Reagan White House staff, I happened to be in the Situation Room the night we bombed Libya -- and when I read The Lion's Game it all came back to me. Then, as I said, he followed up that story with two more thrillers featuring the same characters in The Lion and The Panther. I kept in touch with him and when my second thriller, Gambit, came out, he very graciously read it and gave it a great "blurb" that my publisher printed on the front cover. I'll always be grateful to him for that. 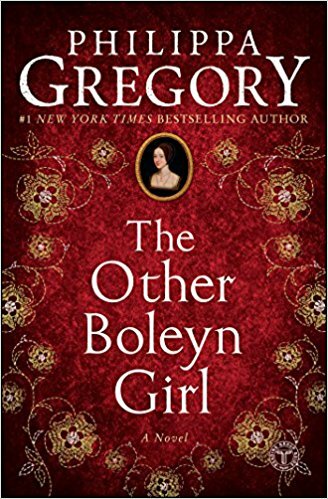 Girl, the story of his initial affair with the 14 year old sister of Anne Boleyn who actually bore him two children. We know they never married -- however, if he had worked it out to marry her, think about it -- he would have had an heir and would not have had to marry (and kill or exile) all those other wives. In fact, that particular novel was so popular, it was turned into a movie. 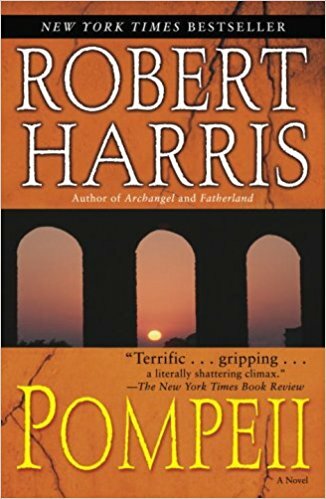 If you like to read historical novels as I do, I'd like to recommend one more bestselling author, Robert Harris, who was a TV correspondent with the BBC in England, and has written about many different events throughout history -- and I have to say I learned so much about other parts of the world and what happened there so long ago -- I thought you might like to check out his stories, if you haven't had a chance to do that yet. One in particular came out several years ago, but it made such an impression on me, I wanted to highlight it here. It is Pompeii. Harris created characters who were vacationing at the seaside resort, leading their carefree lives, never having an inkling of a cataclysm to come.....except for one young engineer who examines the famous aqueduct, sees cracks and tries to warn about a looming disaster. This author truly recreates a city on the brink of destruction. So, yes, these and other fine authors have managed to take recent or historical events and create not just great fiction but what we should probably call "Faction." But what if it happens the other way around? 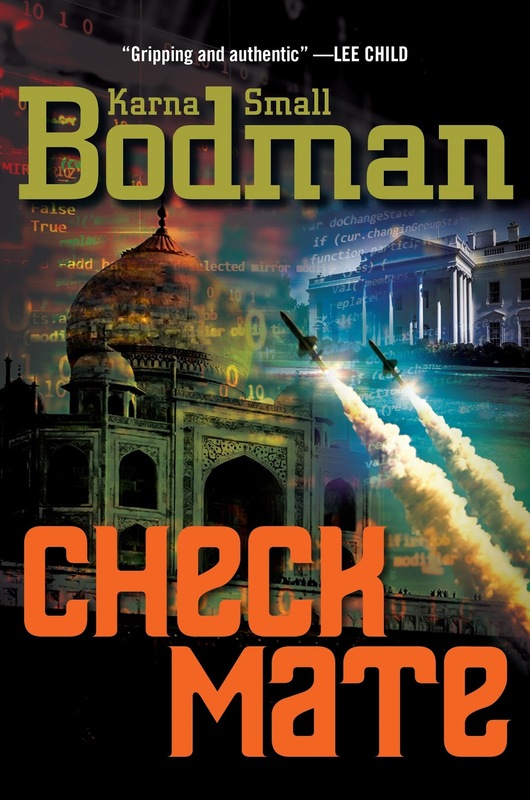 When I wrote my first thriller, Checkmate, that was published a decade ago, it was inspired by President Reagan's Strategic Defense Initiative -- his program to develop missile defense. What are some of the novels based on current or historical events that you have enjoyed and would like to recommend to our readers? Please leave a comment - we'd love to know. And thanks for checking in here at Rogue Women Writers. Can you imagine taking a flight without x-ray machines, security screenings or TSA officers? Up until the early 1970’s, this was the reality of air travel in America despite a large number of hijackings that took place between 1961 and 1970. In those “golden days” of skyjacks, most of the hijackings were motivated by money or as a protest against the Vietnam war--and they usually ended peacefully. Many of the hijackers were motivated by sympathy towards the Cuban revolution and simply wanted to land the plane in Cuba and “gift” the aircraft to Fidel Castro. Sure, there was an economic cost to these events, but there was very little bloodletting in the early days. Airlines and the government were willing to absorb the economic costs of these crimes rather than invest the substantial funds needed to provide effective security. That's not to say that the United States government ignored the problem. They created an FAA group to study hijackings, and they invited suggestions from the public on how to battle this crime wave. The public didn't disappoint, sending in thousands of suggestions, including making all passengers wear boxing gloves so they could not hold a gun, arming flight attendants with tranquilizer darts, building a fake Havana Airport in Florida to fool hijackers into thinking they had reached their destination, and then arresting them when they left the plane--and my personal favorite, installing a trap door in the floor immediately outside of the cockpit so pilots could drop the hijackers 20,000 feet when they tried to takeover the craft. None of these ideas were ever implemented. Of course the problem only worsened. Between 1968 and 1972, 130 American aircraft were hijacked and motives were shifting. Monetary demands were skyrocketing upwards and new political motives, many tied to the conflicts in the Middle East were now taking center stage. 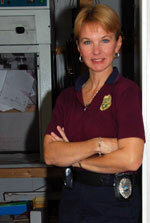 The destruction of property and the reality of violence were becoming more severe and painful to endure. In 1970, one event changed everything. On Sept 6, 1970, the Popular Front for the Liberation of Palestine (PFLP) attempted their most ambitious operation to date, trying to hijack four planes from Europe bound for the United States, succeeding in taking control of three of them. On Sept 9, they hijacked yet another plane bound for America. Three of these aircraft were flown to an abandoned British airfield in Jordan named Dawson’s Field, which then became known as Revolution Field. The hostages were removed from the aircraft and the multi-million dollar aircraft were summarily blown up. The Jordan government responded by declaring martial law, initiating military operations against a number of radical political groups within the large Palestinian refugee population ensconced in Jordan. These events cascaded into the Jordanian Civil War, often referred to as Black September, which included a covert Syrian invasion of Jordanian territory. While the government of Jordan was successful in maintaining control of their country, their relationship with the Palestinian people and the political shape of the Middle East would never be the same again. The fallout included the formation of the notorious terrorist organization known as Black September, a group that carried out many well-known operations, including the massacre of Israeli athletes at the Munich Olympics in 1972. Over a few weeks, all of the hostages from the hijacked aircraft were released and returned to their home countries in exchange for the release of a number of Palestinian radicals who were being held in prisons in various countries. This ambitious and successful cluster of hijacking operations had changed the shape of the Middle East and world air travel forever. Eerily, on Sept 11, 1970, President Nixon began an initiative to deal with this new crisis of “air piracy.” His immediate direction included seven steps to increase security, including: appointing the first 100 armed Air Marshals to travel on aircraft, enhancing international co-operation on aircraft security, and transferring x-ray technology available to the military to the civilian sector. While the program began immediately, it was not fully implemented until after a hijacking in 1972, where three convicted felons hijacked a commercial airliner and threatened to fly it into a nuclear facility. By 1973, airports looked very much like they do today. Since then, with the tragic exception of Sept 11, American passengers and aircraft have rarely been the victims of hijackings. The actions of Nixon and the international community had brought this epidemic of crime and terrorism to an end. While hijackings still do occur with some regularity in other countries, they tend to occur outside of Europe and North America and do not get much coverage in western media. We need to remain vigilant to ensure this safer trend continues. yes, I know you can pay for limited Internet access on a plane, but I’m cheap. The notes are in a folder on the floor under the seat in front. To get them, I’d have to fold up my laptop, put up the tray, lean over, without banging the laptop, my neighbor, or the guy in the seat in front. And even if I managed to get hold of the notes, the laptop takes up the entirety of the tray, so I’d have to juggle notes on my lap without dropping them on the floor or my neighbor. I hate it when we take off. I hate it when we land. I hate it when I’m sitting. I hate it when I stand. I think I’ll wind up in a box. Every time I check in for a flight, the airline offers me extra legroom to upgrade to Economy Plus for a mere $89, or sometimes $189 – per person. 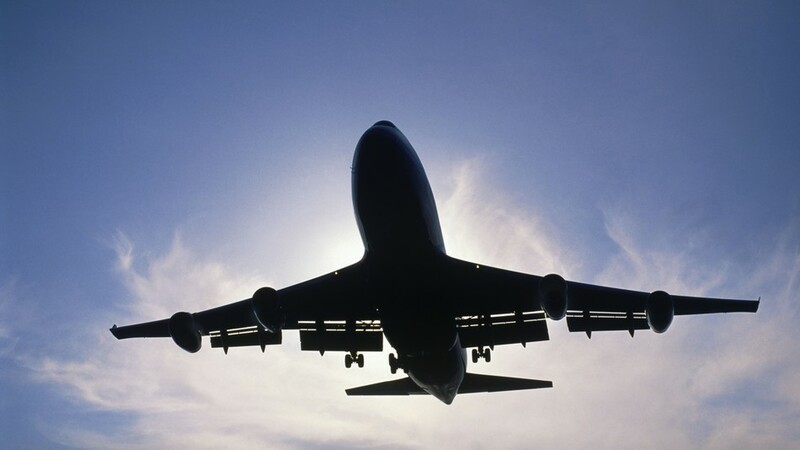 Did you know that sitting in a cramped seat on an airplane is a risk factor for deep vein thrombosis? Have I mentioned that along with being a hypochondriac, I’m cheap? Of course I have. Probably several times. So, okay, I’m a walking stereotype. But in the battle between hypochondria and cheapness, cheapness generally wins. I’d rather sit here and complain and plot suits against the airline than pay an extra $200 or $400 each way for what the airlines should be providing – sufficient room to stretch your legs. Or figure out a cheap way to stretch my legs and avoid deep vein thrombosis: which is why my husband always wants an aisle seat, and for a long flight, I also like the aisle – so we chose seats on opposite sides of the aisle – which is also why I’m rubbing elbows with a nice young woman instead of my husband. He’s close enough I can hold his hand on takeoff and landing; we can pass snacks and drinks back and forth, but otherwise we’re on our own. Every person who passes on the way to the bathroom inevitably bumps into my arm or my shoulder. Sometimes they apologize, but mostly they don’t. On the good side, I can periodically stick my legs out into the aisle, wave them around, and trip people. Me, stressed on a plane. It used to be on cross-country flights, you were served a meal. It wasn’t great, but it was something to keep you from eating the in-flight magazine. It maybe didn’t taste much better, but usually there was cake or cookies. The meal took up time, and making fun of the food was entertaining. Or you could order a kosher meal. It was usually a step up from the regular airplane food. I knew non-Jews who pretended to be orthodox just to get the kosher food. Now, all you get is a can of soda and some pretzels – if you’re lucky. The air flight attendants handed out pretzels to some of us, but not to others. I’ve been puzzling over who was chosen and why. Maybe it’s just another life lesson, to teach us the randomness of good things – except that I don’t even like pretzels all that much. I just feel I deserve pretzels as much as any other passenger. I know some people like to write on planes, and I’m trying to understand why. Do they fly first class? I could write in first class, maybe, I’d have room for notes and books, maybe two laptops. I’d have good snacks, and access to all the coffee I want – another thing I can’t get on a plane. Would I feel bad about the people in economy who were deprived even of pretzels? I like to think I would. The pilot just announced that we’ll be touching down in half an hour. Tomorrow, I’ll have a table, my notes, snacks, and a lot of coffee. While my daughter’s at her job, I’ll be working on the novel – in between exploring West Hollywood. Today, to my surprise, I wrote an entire blog post in an hour and a half. So maybe writing on a plane isn’t impossible after all. So what about you? 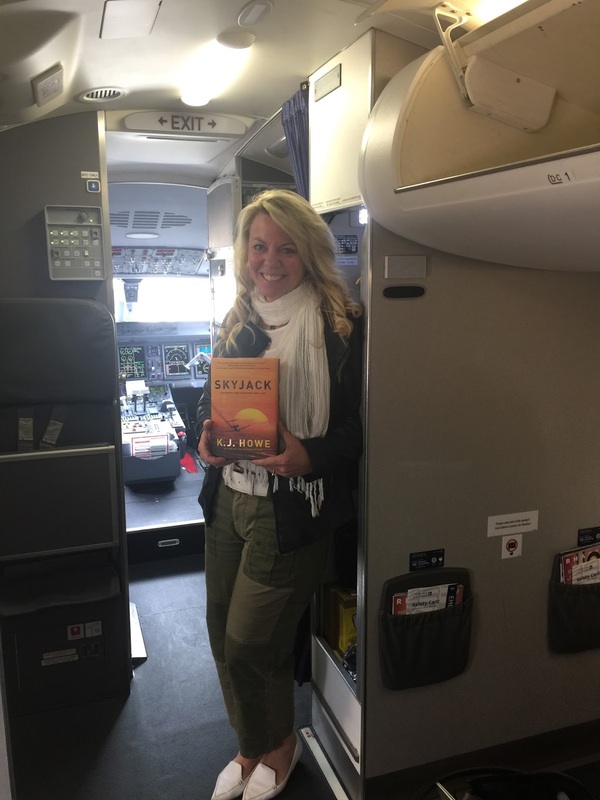 Can you get anything done on a plane? 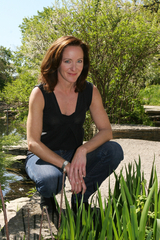 Gayle Lynds: There’s an old saying in an author’s life — writing is 10 percent inspiration, 90 percent perspiration. So what do you do when you run out of perspiration!?! I recently had complete hip replacement surgery. So did 94-year-old Prince Philip. He’s my hip hero, and I'll bet the hospital gave him the same ugly white socks to wear that mine gave me. Still, my new hip is grand. I hope his is, too. I move easily and am pain free. Dare I believe my hip is bionic? But, oh, the ongoing recovery from surgery! I feel as if I’m an 8-cylinder Jag operating on a lawn mower engine. Where's my energy? Worse, where's my mind? I didn’t realize I’d have anesthesia fog, or meds fog ... or whatever the heck it is. Then last night I had a revelation. I was curled on my side, my forehead pushed against my husband’s shoulder for comfort. As I lay in a semi-haze, images started appearing in my mind. The faces of strangers. Houses. Mountain landscapes. A cargo ship. As I watched the cavalcade I realized I was witnessing my imagination at work. I’ve always been visual, and I create from that. Hallelujah! Does this mean I’ll be able to write fiction again soon? Tell me, dear Rogue sisters ... how do you get your groove back! S. Lee Manning: When I'm in the zone and writing every day, I hyper focus. The writing is all I think about — even when I'm not writing — and I'm probably more than a little boring to be around. It's part of the curse and maybe the blessing of ADHD. 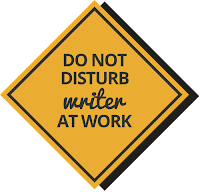 So, when I get out of the groove for any number of reasons — illness, travel, family emergencies, stuff on the news that has me transfixed like a deer in the headlights — I find myself floating in a sea of anxiety and self doubt, asking — how could I think I had the ability to be a writer? No one's going to read this garbage, and what did I think I was doing, writing books? Concurrently, I damn myself for being lazy, for not writing as much as other writers, or for lacking ability to focus. Yada yada. 1. Forgive myself for lapsing. It's how I operate. It's how I've always operated — and I get things done — eventually. Stop calling myself names. Chant it like a mantra. I am not lazy, and I am not a screw-up. 2. Ask someone close to read what I think is garbage — because usually, even if there are flaws, it's not garbage. And if it is, my kids or my husband isn't going to tell me. 3. Turn off the TV. The TV has always been my refuge when depressed or anxious — and I have wasted too much time, curled in its warmth. 4. Write something short. A post for Rogue Women Writers. A comment on someone else's post. Anything that forces me to use words and form coherent thoughts. 5. Go back, revisit, edit whatever I was doing when I was in the zone, until I get into the mindset that I can go forward. Sometimes the entire process takes a few days, sometimes a few weeks, but in the end, so far, this has worked for me. Gayle: What terrific suggestions, S. Lee. 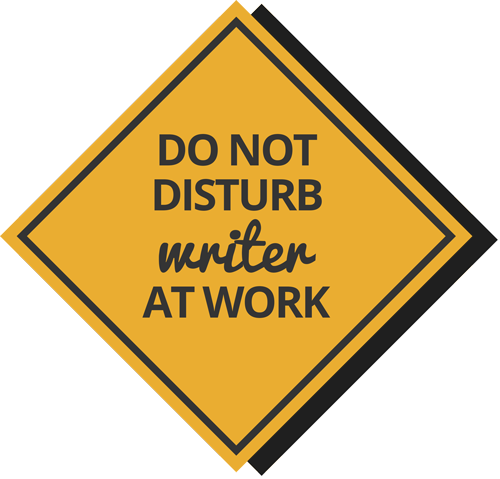 It's a Five Step Program for those of us who've fallen off the writing wagon. Ah-hem. That's me. In my mind, I'm leaping for the first rung on the ladder. Karna Small Bodman: Interesting question, Gayle (first, so glad you're getting back on track). Now I figure with your imagination, combining mountains and a cargo ship, perhaps a great setting for your next thriller could either be Rio de Janeiro or Hong Kong — two exotic places where nearby mountains cascade down to the sea. Gayle: You're giving me chills, Karna. I wrote about mountains and a cargo ship in The Last Spymaster. I can actually remember writing. So that's where my dreamy sequence must've come from. Wahoo! 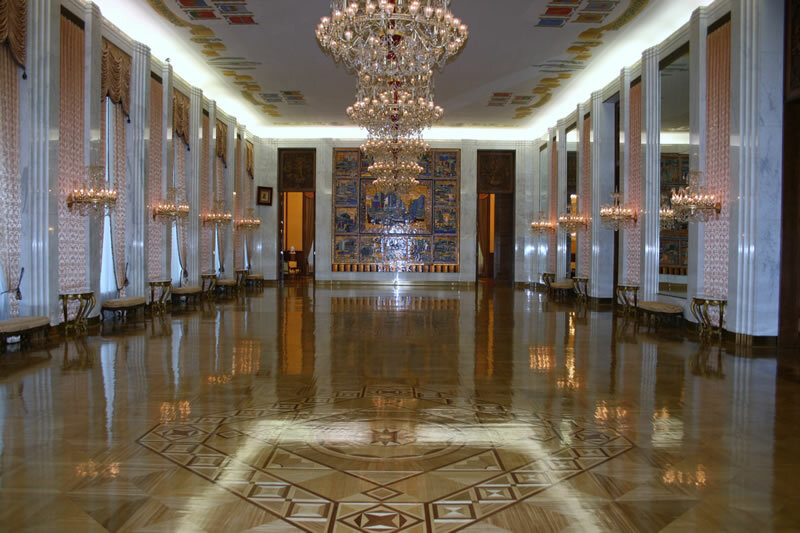 Russian Embassy, Washington: Look for spies! Karna Small Bodman: You're on your way! For me, getting back in the groove after an hiatus is sometimes through a setting, too. For example, we spend spring and fall in Washington, DC and I recall being invited to an event at the Russian Embassy. As soon as I had a chance, I grabbed a piece of scratch paper from my evening bag and jotted down descriptions of their unsmiling security guards, the foyer where ID's were checked and double checked, then the grand ballroom where vodka was liberally poured for all ... and imagined my hero having an encounter over in the corner with a Russian spy he was trying to "turn." It's all about keeping your eyes — and mind — open at ALL times. Now, sit down, Gayle, and conjure up a great plot — can't WAIT to read your next one. Gayle: You're so right that that's what I need to do, Karna. Spasibo! Chris Goff: Isn't it amazing when you start moving better? I didn't have a hip done, but I had a knee done, and it was like getting a new lease on life. 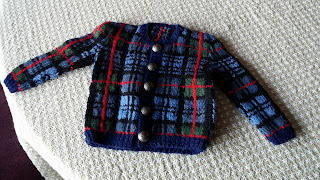 Chris knit this fab McKinlay Tartan Sweater. Wow! Usually when I struggle to write, I don't let myself write. Sort of like when you feel like sneezing but try to make yourself sneeze, you can't sneeze. Sort of like reverse psychology. I tell myself I don't want to write. Anytime I find I want to write something, I don't let myself. I go to the pool or gym. I go play tennis. I go for a walk. I knit a sweater. I have a thing for knitting baby or kid sweaters. It feels like such an accomplishment, and it's a lot faster than knitting a sweater for an adult. This is a sweater I made for my niece. She and I are both McKinlays, and this is the McKinlay tartan — or the closest I could come with yarns from the Lamb Shoppe. It took me a while to figure out the pattern, and there was a bit of tearing out involved, but I love the end product. 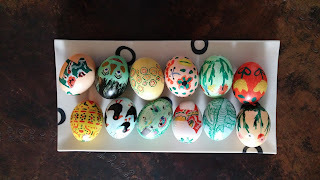 This Easter I painted blown-out eggs. I go to great lengths not to write. The thing is, I hate being deprived, and it doesn't take long for me to get antsy. Then I want to write. Let's face it, we're professional writers. We have to write. So when all else fails, I set a timer, and sit and stare at the screen, and tell myself I can do anything for an hour. Gayle: I'm not gonna write. I'm not gonna write! I'm not gonna write??? Oh, no! I want to! Jamie Freveletti: Well, I can't knit but I've always wanted to learn, so perhaps, Chris, you can teach me! And I love Sandy's suggestions, especially forgiving yourself for the lapse. I tend to beat myself up for the words I didn't write, so I'll have to remind myself that it's a marathon not a sprint. Which brings me to my method - I run! When I'm stuck I slap on the running shoes and hit the track. As I do, I wear earbuds and listen to music and inevitably my mind starts churning with scenes and ideas. It's kind of odd, but perhaps the movement shakes things up. Whatever it is, it works every time! Great to hear that you're healing Gayle! Gayle: Ah-ha, movement. You're right, Jamie — and I have fond memories of my running days. As soon as I get out of physical therapy, I'm gonna hit the pool for my new fave — deep water aerobics! 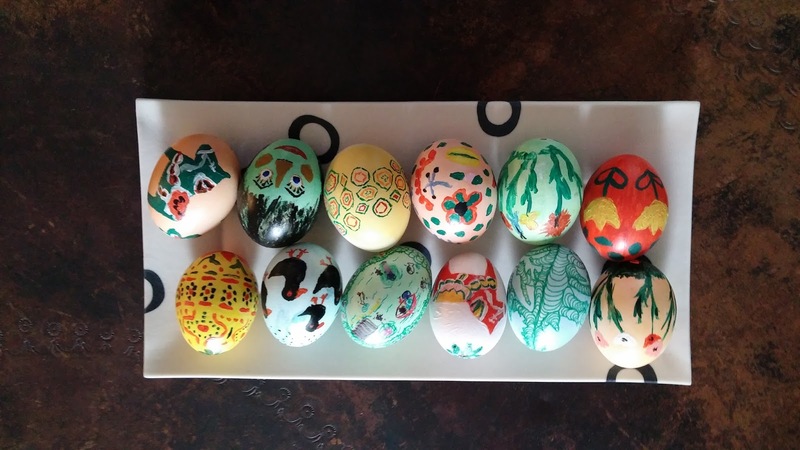 Lisa Black: Love the Easter eggs! I have a very regimented approach to writing, I think, and that is both a blessing and a curse. I don't start until I have a solid plan in mind (which is, somehow, never solid enough and halfway through the first draft I'll be berating myself for starting before I was ready), but once I start I have myself on a strict word count requirement for each day. That is suspended only for vacations, major holidays, and if Cape Coral happens to have a homicide that week. I agree with the forgiveness aspect; this is where I cut myself some slack and let myself take a day or two or three to think through something that isn't working. Eventually an idea will surface. And if I'm really lucky, it will be something that doesn't require a lot of rewriting! Gayle. You are where I want to be right now, Lisa. I love second drafts and revisions. Can we trade??? KJ Howe. Research fuels my writing passion. Meeting experts in the international kidnap and ransom field provide excellent fodder for what can and does happen across the globe today, and then I get to write about it! Gayle. 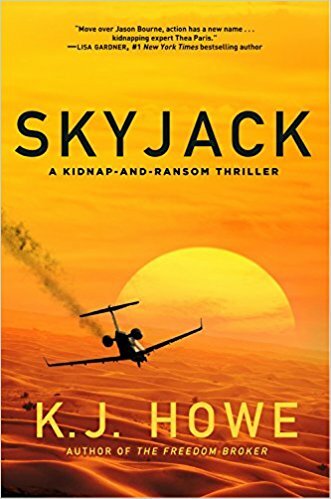 Thank you, KJ, for taking time out from your whirlwind book tour for your new Thea Paris thriller, SKYJACK. And you're right — research fuels me, too. 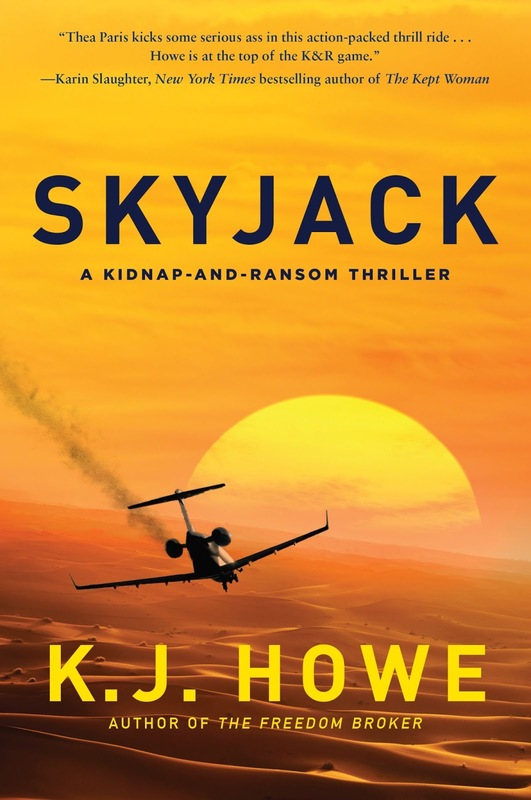 But first, I can't wait to read SKYJACK! Robin Burcell: Oh, my! What a good question, Gayle! (And glad you're feeling better!) For me, I find the biggest obstacle I have is me. I was in Anaheim recently, where I heard DP Lyle, MD, say that another writer (name escapes me) says that the single best advice is Bum Glue. In other words, plant bum in chair and simply start writing. That seems to work for me. Robin, clearly not in her chair working! My problem is that my glue doesn't stick. It's always an excuse: oh, if I had a better desk (like one that doesn't get messy), or I need to clean the pantry (like I'm big on cleaning. Ha! Trust me, I'm not). In other words, it's like my mind is actively searching for ways to not write. One thing that really helps is a contractual deadline fast approaching. But it's amazing how much time I can fritter away when that deadline is weeks away. When it's on the horizon, we're talking 15 hour days! We'd love to hear your tips and tricks! So, Rogue Readers, have you ever lost your groove? And if so, what did you do to get it back?